The 14 in. chainsaw replacement chain fits the Toro<sup></sup> PowerPlex 40V Max* 14 in. 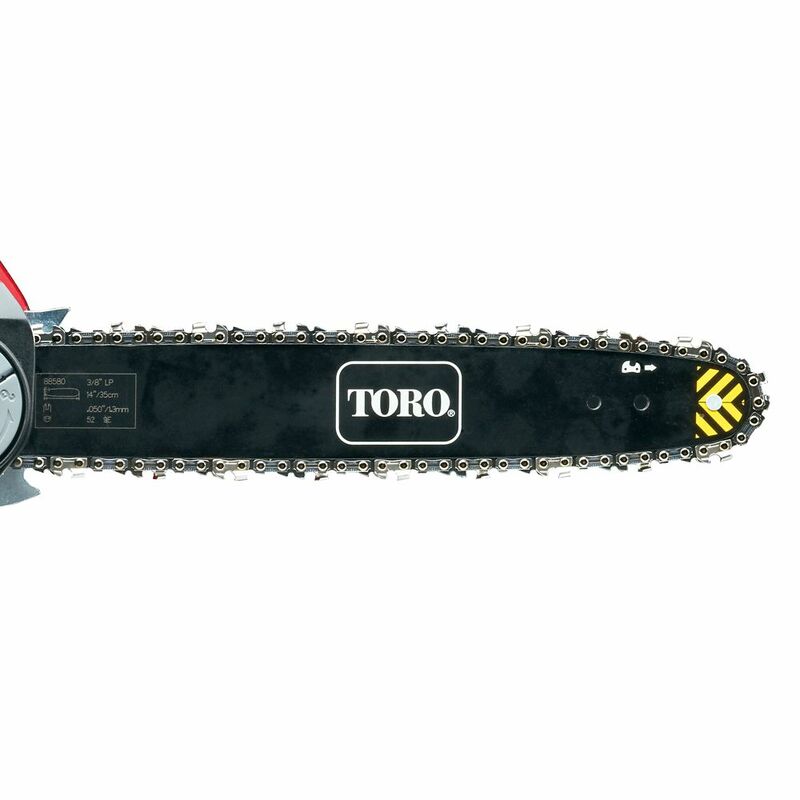 40-Volt chainsaw (51880 & 51880T). One chain per package. The replacement chain has 52 drive links, a 3/8" pitch. 0.043" guage and uses a 4.5 mm file. One replacement chain per package. The EGO replacement chain saw chain is the only replacement chain recommended for use with the EGO Power+ 14 inch Chain Saw (CS1401, CS1403). The replacement chain is manufactured by Oregon (90PX052X), and is a component of Oregon's Micro-Lite Narrow-Kerf cutting system. The low-kickback design enhances user safety. Our 10-inch Saw Chain is to be used with our M18 FUEL 10-inch Pole Saw w/ QUIK-LOK (2825-21PS) and M18 FUEL QUIK-LOK 10-inch Pole Saw Attachment (49-16-2720). The replacement saw chain design gives you fast cuts with low vibration and minimum kickback. The chain features a durable design and is weather resistant for increased life. The Milwaukee 16 inch Saw Chain is to be used with the Milwaukee M18 FUEL 16 inch Chainsaw (2727-20). The design delivers fast cuts with low vibration and minimum kickback. The chain features a durable design and is weather resistant for increased life. 91PX is for homeowners and occasional users who want a low-vibration and low-kickback saw chain. The Chamfer Chisel cutters'' twin cutting corners offer outstanding performance. These cutters are durable, easy to maintain and forgiving in across a range of cutting conditions. PowerPlex 40V Max 14 Inch Replacement Chainsaw Chain The 14 in. chainsaw replacement chain fits the Toro<sup></sup> PowerPlex 40V Max* 14 in. 40-Volt chainsaw (51880 & 51880T). One chain per package.